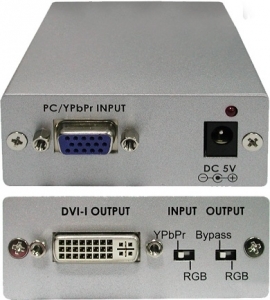 • Analog PC/HD signal to digital LCD monitor. • Connect computers with analog PC output or DVDs with HD output to digital DVI-I monitors or projectors. • Select input between analog RGB and YPbPr manually. • Select output between Bypass or digital RGB manually. • Supports up to 1600 x 1200 @ 60 Hz for PC input and 1920 x 1080p @ 60 Hz for HD input. • Some PC monitor do not supports HD mode.